The 2013 was a great season for Andrew Luck and the Indianapolis Colts. Not only did they reach the playoffs for the second consecutive season, they won their division in dominating fashion, going 6-0 against their division rivals. The Colts averaged a little more than 24 points a game last season, and scary enough, the offense will be even better this season. Not only will Reggie Wayne be healthy, but the Colts signed free agent WR Hakeem Nicks. Trent Richardson will be more comfortable in the offense and a healthy Ahmad Bradshaw will help the run game as well. There is Peyton Manning, Aaron Rodgers and Drew Bress, then there is Andrew Luck. The 24 year old QB is right outside that elite status but is clearly on his way. Luck had a huge turn around in his sophomore season, cutting his interceptions in half from his rookie season. He threw 18 picks with 9 fumbles in his rookie season, to just 8 interceptions and 5 fumbles last year. He threw 23 touchdowns in both. Things will get even better for Luck in 2014. Reggie Wayne is back and healthy after tearing his ACL early last season, the team brought in free agent Hakeem Nicks, and T.Y. Hilton is turning into one of the best playmakers in football. Oh yea he also had two young talented tight ends in Dwayne Allen and Coby Fleener. This could be the year Andrew Luck joins that elite group of QBs. We ranked him 5th in our QB rankings. Everyone thought Richardson would thrive in the Colts offense, coming from an awful Browns team. However we all know that wasn't the case. Richardson really struggled as he averaged just 2.9 yards per carry and scored only 3 touchdowns in 14 games. Things should turn around this year, as Richardson has had a full season, plus an off season to get familiar with this offense. We all know he has the talent, as we saw him score 11 touchdowns and run for 950 yards his rookie season. With opposing defenses focusing so much on Andrew Luck and the passing game, things will come easy for Richardson in 2014. We ranked him 31st in our RB rankings. With Donald Brown gone and Vick Ballard done for the season, Ahmad Bradshaw has the backup RB job all to himself. The question is can he stay healthy? Last year was his first with the Colts and Bradshaw lasted just 3 games before neck surgery ended his season. Bradshaw will be a nice mix to this offense as he is valuable in the passing game and could see extended playing time if Richardson continues to struggle. From 2002-2012 Mr. Reliable, Reggie Wayne, never missed a game. Last year Wayne missed the final 11 games after suffering a torn ACL. However he is back and appears to be healthy, which is good news for Andrew Luck. From 2004-2012 Wayne had over 1,000 yards each year, except for 2011 where he finished with 960. Wayne has unbelievable hands as he appears to catch anything thrown his way. He's not the flashy type but he will constantly move the chains. Luck will take full advantage of a healthy Reggie Wayne this year. We ranked him 31st in our WR rankings. Once Reggie Wayne was lost for the season, T.Y. Hilton was forced to step up, and he did. In just his second season, Hilton finished with 82 catches for 1,083 yards and 5 touchdowns. And let's not forget his 13 catch, 224 yards, 2 touchdown performance against the Chiefs in that playoff game, where the Colts overcame a 28 point deficit in the second half. Hilton can go back to playing the slot as Wayne and Nicks will be on the outsides, and Hilton will humiliate defenses. He's extremely quick and no linebacker can keep up. Expect another huge season from Hilton. We ranked him 25th in our WR rankings. When Nicks is healthy, he plays like a top 10 wide receiver. However he always appears to be slowed by an ankle or foot injury. Last season with the Giants Nicks was a non factor. He caught 56 balls for 896 yards and failed to score a touchdown. In 2012 he failed to reach 700 yards and scored just 3 touchdowns. It appears Nick is healthy again and won't be the main focus for defenses. I truly believe if he's 100% healthy he can become that guy we saw in New York in 2010 & 2011 who averaged 77 catches, 1,122 yards and 9 touchdowns. We ranked him 42nd in our WR rankings. 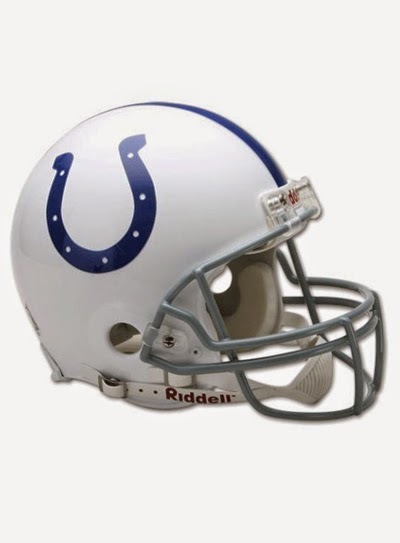 The Colts will run a 2 TE set a bunch this season, but with all the options at the WR position, Allen will stay on the field for most of the game. Allen's lone catch last season was a 20 yard TD before being placed on the IR. He caught 45 passes for 521 yards and 3 TDs during his rookie campaign. We ranked him 18th in our TE rankings. If and when Fleener can stay healthy, and learn how to block, he will get more playing time. When that happens, you will want him on your roster. Keep an eye on him this season and be ready to pounce! He caught 52 passes for 608 yards a 4 TDs with Allen out all of last season.